Goal: Laying the foundation for putting trash paper in a tr ash can as well as developing fine motor skills. Materials: work mat, tray, basket, five pieces of paper (ie, tissue paper, wrapping paper, construction paper) Avoid using paper with words (ie, magazines, newspapers, books) so that you can model for the child how to respectively handle written material. Sit facing the infant with the work mat between you. With the work mat in front of the infant, put the tray on the mat. 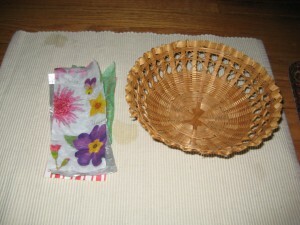 Then take the paper and basket off the tray and place them on the mat, setting the tray aside. When you have the infant’s full attention, pick up the first piece of paper (on the left). With both hands, slowly and purposefully crush the paper into a ball. Pause and smile at the child, the drop the ball into the basket. Allow the infant time to try the activity on their own, if they don’t respond ask, “May I help?” and then crumple the paper with the infant. Once the child is occupied with the activity, step back and allow them to continue on their own. 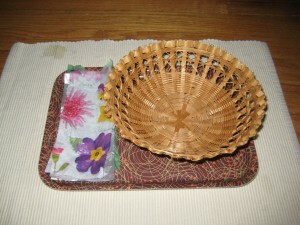 hen the child is finished with the activity, take him/her with you to return the work and mat to its proper place. 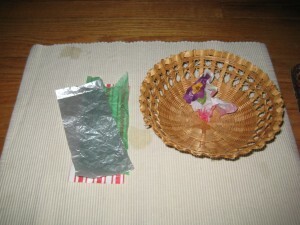 You can assist the child in throwing the crumpled paper in a trash can or you can flatten it for reuse.